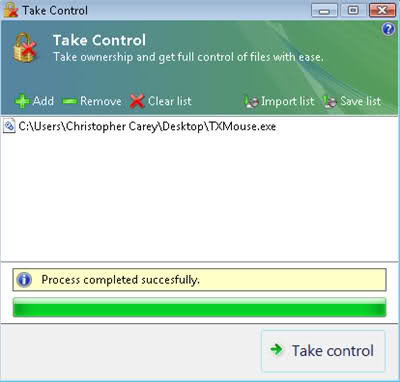 Take Control lets you take ownership and get full control of any system file with ease (Windows 7, Windows 8 and Vista only). This is really very useful tool for replacing the system files. Thanks a lot XPero. Very useful tool. Great job XPero! I was looking for such a tool, thanks a lot. Thanks for the useful program. Keep up the great work. Just add this file to your redistry and right click on the file you want to own and click on "Take Ownership". XPero I like they way you designed this program Its so user friendly so simple looking and so usefull. What about a different icon for the application??? Edited by yoni5002, 19 May 2007 - 02:09 PM. BTW, did you find any bug (technical or usability related)? Let me know please as well as your suggestions. Edited by XPero, 19 May 2007 - 04:03 PM. file is gone can you reup?